Coach's Corner - "Dodgers Legends" group signed Sport magazine. 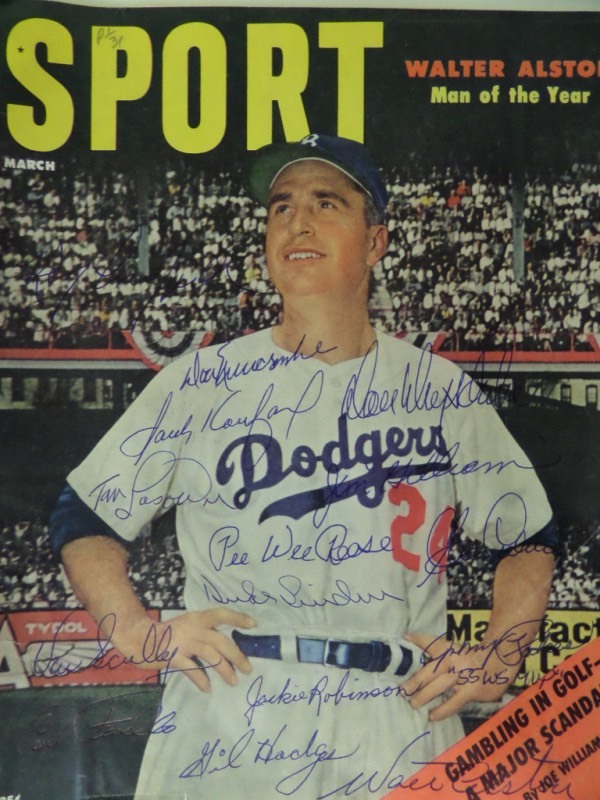 Go Back to Lot List "Dodgers Legends" group signed Sport magazine. This vintage full and color covered magazine shows HOF Skipper Walter Alston on the cover and comes ink signed by at least 15 others. I see many stars, legends and HOF'ers appearing, among them: Jackie Robinson, Pee Wee Reese, Drysdale, Koufax, Newcombe, Duke, Gil Hodges, Jim Gilliam and more. Cool piece, centered around the 1955 team mostly, and value is over a grand on the historic Brooklyn one of a kind.